Born: 20 March 1913, Johannesburg, South Africa . Died: 21 February 1987, Reading, England . 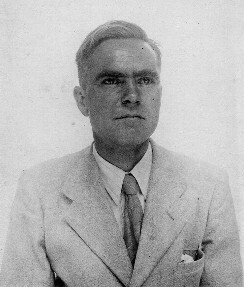 David A. Haig graduated in 1936 with a BVSc degree and later obtained a DVSc at the Veterinary Faculty of the University of Pretoria at Onderstepoort. Initially he spent eight years in the field and at the Allerton Laboratory in Natal, working particularly on bacterial diseases of cattle and poultry. In 1945 he was transferred to the Virology Department at Onderstepoort, where he developed a canine distemper vaccine that was to become the gold standard throughout the world. After spending two years (1959-1961) at the Kabete Veterinary Laboratory in Kenya, he transferred to the British Agricultural Research Council�s Compton facility as it�s first head of Virology. His work there mainly concerned the transmissible agent of scrapie, a sheep disease related to, and a model for, the human Kuru and Creutzfeldt-Jacob diseases. He was the first to suggest that the virus does not contain nucleic acid, in direct conflict with the "central dogma" of molecular biology at the time. This was regarded as a "spectacular contribution" by one of his colleagues. He also published on a variety of other animal viruses, mycoplasms and rickettsias. In 1967 he took over the additional post of head of the Bacteriology Department at Compton, until his reretirement in 1977. Though his health had always been frail as a result of polio contracted as a child, he lived for a further ten years after his retirement. He was honoured as an Officer of the Order of the British Empire (OBE). Obituary: D.A. Haig. Veterinary Record, 1987, Vol. 120(11), pp. 261-262.